There are many different ways to conduct a bicycle tour. You can camp, stay in hotels and hostels, or simply stay with friends. If you’re planning to do any camping though, you’re going to need a good tent. And selecting the right tent for your long distance bicycle tour is of top importance. Your tent is your home out on the road and you want to be comfortable inside your home. For that reason, you need to find a tent you are going to be comfortable living in for the duration of your tour. For this reason, I recommend that you select whatever tent is going to make your feel most at home. 1). First of all, you need to keep the size of the tent in mind. 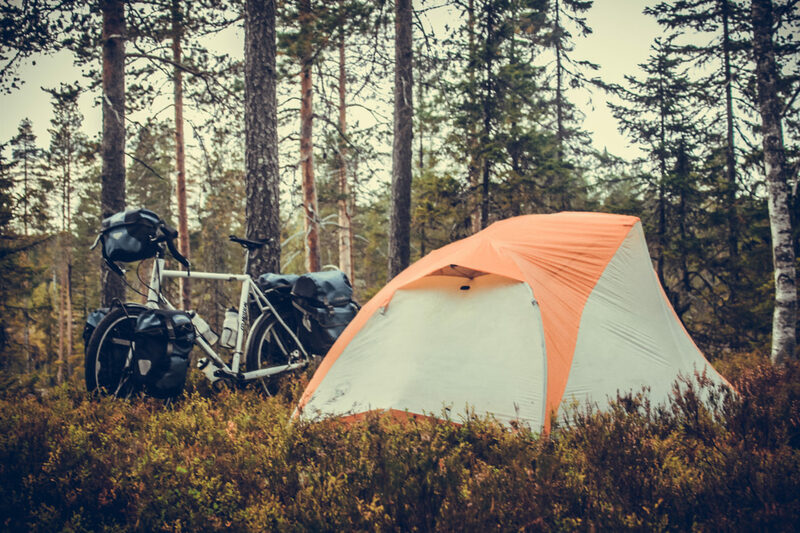 Before buying a tent, be sure that it is small enough to fit on the back of your bike or inside one of your panniers. My MSR Zoid 2 Two-Person Tent fits inside my rear pannier and takes up just a little more than half of the bag. If you are carrying a 3-man tent or even something larger, your tent will obviously take up much more space. 2). Secondly, you need to select a tent that is lightweight. As with every piece of gear that you bring with you on your long distance bicycle tour, you need to find the lightest instruments possible… and your tent is no different. Be sure to look at the weight of every tent you investigate and do everything in your power to make your tent as light as it can be. How do you do that? Well, I’ll tell you! First of all, cut off all extraneous straps or cloth that you don’t or won’t need on your tour. Secondly, leave any extra poles or parts at home. Many tents contain “extras” that you “might” need, and while it’s nice of the tentmakers to include these extra materials, leave these extraneous parts at home. Below is a diagram of my tent, showing where the tent stakes are supposed to be driven into the ground. As you can see, my tent supposedly needs eight (8) stakes just to hold it into the ground, and one (1) additional stake that is used to mount the rain fly. The way that I eliminate the number of stakes I carry with me on my tour is by simply not using stakes number 3,4,7, or 8. The reason I don’t need these stakes is because stakes 1,2,5, and 6 are the ones that really hold the tent to the ground. Stakes 3,4,7, and 8 only help to make the tent wider, and for this reason, I feel they are quite unnecessary. If you are using a different tent, you may not be able to use this same technique, but it’s worth looking into before you leave home, as you will be able to eliminate a small amount of weight. Note: Breaking a tent stake is a possibility and for this reason I recommend you carry one (1) extra stake with you in the event of a break. If, however, you break more than one stake, I recommend you improvise by using a stick or wire… and you should also consider practicing your hammering skills. Never use your foot to drive your stakes. This is a surefire way to break or bend your tent stakes. Use a rock, a stick, your Leatherman, or other nearby objects to drive your stakes into the ground. DO NOT bring a hammer with you for the sole purpose of using it to drive your tent stakes at night! 3). Color can also be very important when selecting your tent – especially if you plan to do any sort of stealth camping. When doing this type of camping, you want to do your best to hide yourself amongst your surroundings, and in most cases, your surroundings are going to be a combination of green and brown colors. You’ll note that the rain fly on my tent is mainly brown and I selected this tent largely for the reason that it would allow me to hide in bushes and branches if so desired. The photo below is a good example of how you can disappear into your surroundings with the use of an earth toned tent. The last thing to note about the color of your tent is that you may want a bright colored tent (or at least a partly bright colored tent) if you get into an emergency situation and you want to signal for help. While I have yet to find a tent that is camouflage on one side and bright red or orange on the other, I’ve resolved this problem by touring with bright red panniers and wearing bright red clothing and then using my brown tent to hide in. This allows me to hide in my tent at night and when so desired… and if needed, I could use my bright colored panniers and clothing to signal for help. 4). The final point I want to make about selecting a tent is that your tent should be well ventilated. On my first bicycle tour I bought a tent for $30 and thought it would do me just fine, but I quickly learned that the reason this tent was so cheap was because it was totally unventilated – meaning there was no way for air to get into or escape from the tent. The main problem with having a tent that is poorly ventilated is that during the night, condensation builds inside the tent, and by morning, there will be a large amount of water hanging to the top of your tent. Then, as soon as you move or hit the tent’s fabric siding, this condensation will instantly fall onto you and everything inside your tent – instantly soaking you and your gear. This is a bad thing because it gets you and your things wet, but it’s even worse because it’s simply a horrible way to wake up every morning. The last thing you need on your bike tour is to wake up and be instantly drenched in your own condensation – a horrible start to any day on the road! This entry was posted in Bicycle Touring Pro Articles, Featured Articles, Featured How-To Articles, Lodging, Main Articles, Planning, Products, Tents, Videos and tagged 1 person, 2 person tent, bicycle tent, bicycle touring tent, camo tent, cycling tent, cyclist tent, how to select a tent, one person, stealth camp, tent, tent selection, three person tent, what to look for in a tent. I have never done an overnight tour but am planning one for my retirement. I am about 6 feet tall 200 pounds and feel like the one man tents are a little small for me and my gear. I was thinking of the MSR Hubba Hubba. What are your thoughts? I, like you, and six feet tall, so I know what you are talking about when you say that the one-man tents might be too small for you. I think you are probably right! You could sleep in a one-man tent of you had to, but you will be much more comfortable in a two-man tent. Plus, with a two-man tent, you can store all your gear inside the tent with you at night and you should still have plenty of room to move around. There are a lot of people who think you have to be extremely minimalist when touring (thus making you think you have to get a one man tent), but I think it is more important to feel comfortable and at home while touring… and a two man tent is going to do that for you! I think the Hubba Hubba you’re looking at will work perfectly. I ran across this tent and ordered it as soon as I saw it. It was love at first site. Its freestanding, stealth camping colors, double walled, and best of all it has a built in enclosed shelter that fits your bike. I used to be up at night a lot worrying about my bike getting stolen, but no more will I be. You can find it at the link below. This is the ’09 model and REI has it marked down to $200 from the regular price of $360. Hey everyone…I have done several bike tours and I am in need of a new tent. I am usually traveling with my wife so I am looking for a 3 man. I bought the North Face Roadrunner 2 and it SUCKED. The fly leaked the first time I used it not because it wasn’t waterproofed but from poor design. Please someone who knows anything about this give me a suggestion…I don’t want to waste anymore money. I’ve found the combination of cheapskate and pot-luck methods has served me well, over the years; I’ve had many great expeditions around Europe in tents bought purely on price, especially during the last dozen years. The technology/construction trickle-down has certainly permeated from cutting-edge mega-bucks expedition tents down to budget versions. I have a Eurohike Eden 2-man tent and a Gelert Solo 1-man tent (both were about the £35 – £40 mark*), neither of which are particularly light, but they work well and have never let me down in wind, rain/snow or cold; in fact the Eden has a 360-degree vent on the top, so no condensation wake-up shower in the mornings. Ok, you’re losing a little on up-to-the-minute features, and carrying a few more grams in weight, but many of the new features get jettisoned along the way, so that you’re down to the three main features (poles, fabric, pegs), anyway. Up-shot: If it’s of good, sound material and the size and weight seems ok, no problem.